The present work is a study in the history of an enduring idea that defines the inner life of the mind and also supplied a substratum for the twentieth-century literary imagination and substance for philosophical thinking, producing a unique alliance between philosophy and literature. This special union was forged by a new holistic conception of time which supplemented, and even supplanted, the conventional sense of chronological time. This temporal turn animated the existential insights of Husserl, Heidegger, and Bergson, but it was grounded in nineteenth-century advances in the biological sciences, the hegemony of Hegelianism, and even stretched back to Augustine's early meditation on time in Book XI of his Confessions. 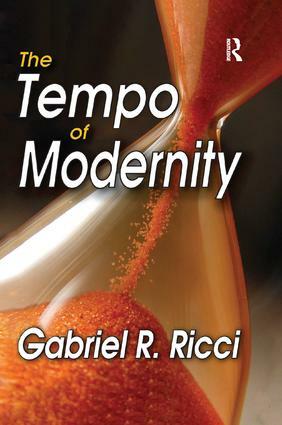 In linking together a set of thinkers who addressed this form of temporal consciousness, Gabriel R. Ricci illuminates a common intellectual preoccupation from the vantage point of a concept. The authors do not together assemble the thought; it is the thought that produced a collective voice. This voice appears in the episodes outlined in each chapter, and they are framed by an introduction, which explores Joseph Frank's insights into the new spatial forms in literature, and an epilogue, which resurrects J.W. Dunne's peculiar dream experiments and theory of precognition. Ricci employs Frank's seminal essay to draw comparisons between literature's adaptation of the new time sense and philosophy's expression of the new compatibility between space and time. Dunne's theory serves to demonstrate the continuity between literary form and philosophical speculation.